Laywood and Laybrick are two specialty 3D printing filaments from Germany. The brainchild of Kai Parthy of cc-products, both filaments provide an added dimension to Fused Deposition Modelling and Fused Filament Fabrication 3D printing. 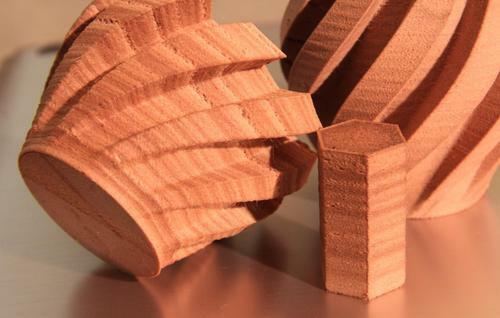 Laywood, the 3D printing filament that is infused with wood pulp, has taken the world by storm. Laywood 3D printing filament does not warp during printing, shows no shrinkage at all and also requires no heated bed - all in all one of the easiest 3D printing filaments to work with. Printing at various temperatures provides a finished product with different colours - 190˚C for light coloured wood and 230 ˚C for dark coloured wood. Laywood can also be processed the same as wood, meaning it can be sanded ground or painted. Laybrick, the filament that is infused with natural minerals such as limestone, is another one of the offerings from Kai and co. Laybrick is perfectly suited for large architectural projects as it requires no heated bed and exhibits no warping and shrinkage during or after printing. Laybrick also allows the user to control the finish of the surface by varying the extruder temperature - 190˚C for rough surfaces and 210˚C for smooth surfaces. Products 3D printed with Laybrick can be finished by sanding and painting. Although it has mostly been used for aesthetics purposes, Laywood and Laybrick signal an era of innovative and creative 3D printing filaments. Laywood and Laybrick is available at the 3D printing filament store brought to you by Mēkā. Also available are PLA, ABS, NinjaFlex, Carbon Fibre PLA and High Temperature PLA. Visit the 3D Printing Materials Store by Mēkā.